We have a trade to announce! For only the second time during an NWHL season, there has been a trade and it involves the same two teams that first pulled off a swap during the league’s inaugural season. On Jan. 2 the Metropolitan Riveters acquired goaltender Maria Sorokina from the Connecticut Whale in exchange for future considerations. In a corresponding move, first reported by Erica Ayala, the Riveters also released forward Fiona McKenna in what was described as an amicable understanding. The Riveters still have 22/25 roster spots filled with three spots available to add free agents or draft picks (once their college season ends) for the stretch run. The Whale, for now, only have two goalies on their roster – Meeri Räisänen and Sam Walther. Sorokina hadn’t appeared in any games for the Whale this season, so if/when she debuts for the Riveters it will be the first time she’s on the ice during an NWHL game other than pregame warmups. The 23-year-old Russian netminder will obviously have to battle current Rivs goalies Katie Fitzgerald, Kimberly Sass, and Sarah Bryant for ice-time. But one would think the team wouldn’t have traded for a goalie that they aren’t going to play at all, right? With two and a half months left in the 2018-19 season, the Riveters currently find themselves at the bottom of the NWHL standings (2-8-0). Last year’s playoff MVP Fitzgerald (1-7-0) has not had a stellar campaign – already surrendering as many goals as she did during all of last season (28) and Sass has been more than admirable in her two starts (1-1-0). 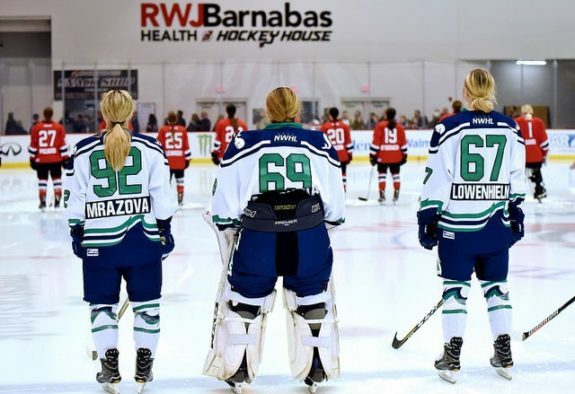 Perhaps the Rivs are planning to play Sorokina at some point in a last-ditch effort to jump-start their team during one of the final six regular season games as we approach the 2019 Isobel Cup playoffs. Sorokina has represented the Russian National Team at the World Championships three times (2015, 2016, 2017), and played the last four seasons in the Zhenskaya Hockey League for Dynamo St. Petersburg and Agidel Ufa. During the NWHL preseason in 2016, she proved that she is capable of competing at this level when she played in and won two preseason games for Team Russia against Connecticut and the Boston Pride, surrendering three goals on the 45 total shots that she faced. “I want to start off by thanking the Connecticut Whale for the work. Thank you for giving me the opportunity to continue my journey in America. I wish the Whale and their fans good luck and good health,” Sorokina said in a statement via the NWHL after the trade was announced.